We all know Google for its exceptional performance in software, needless to say. But not a lot is known about their new efforts in conquering the hardware world. The company is trying to marry its smart software with the gear we run it on. The Google Wi-Fi system Router is now the newest addition to its collection of hardware. Let's have a closer look with our Google WiFi System Router Review. Google WiFi falls in the category of very few routers that offers a mix of smart design with simple features and solid performance. The router system is here to eliminate some key pain points and provide an easy transition to the connected home. Google partnered with ASUS and TP-Link to come up with a set of routers that don’t look terrible and are easy to use. The router is primarily designed to eliminate WiFi black spots and the need for costly extenders. Previously Mesh Network Systems were used only for large commercial applications like convention centers, malls, hospitals and large companies that require a good Wi-Fi signal spread out over a large area. These systems were very expensive and not cost prohibitive for the average homeowner. 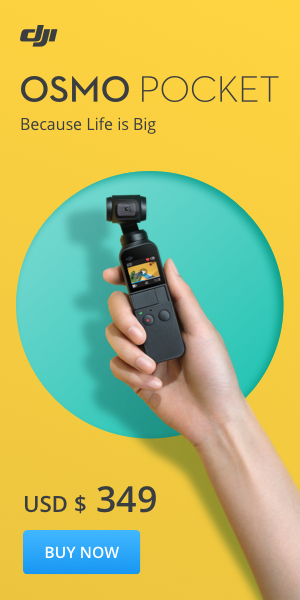 Recently a number of companies are creating consumer models and are bring the price down to a more reasonable price Companies like eero home Wifi System and Linksys Velop Tri Band among others. 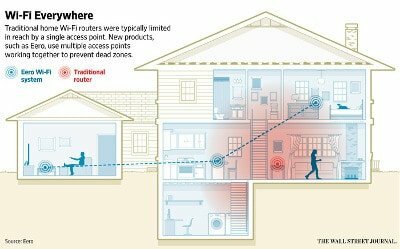 What a mesh network essentially does, is you now will have a number of hot spots in your home instead of one central router this system greatly eliminate the need for extenders and a reduces dead zones creating a strong Wifi signal through your home. 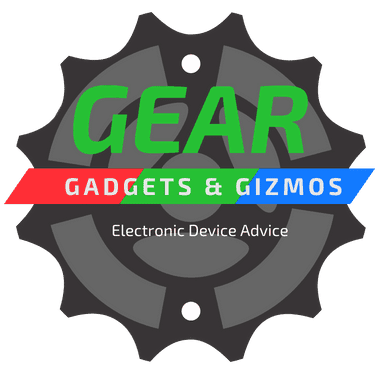 Mesh Networks are designed for easy installation and systems can be easily expanded. If you have a larger home, you'll probably want to add extra WiFi points. With this Google WiFi system, all you need is to tell the app that you want to add a new device, and then plug it in. It’s pretty simple; you don’t need things like bridge mode. The WiFi and the mesh network it creates enhance the performance of this router set, more consistent coverage over a large area. Think of Google WiFi routers as light bulbs; you can put them wherever you need them. As a basic guide, Google advises one unit for about every 1,500 square feet of space. Unlike extenders which can experience disruptions during handovers and transitions, the Google mesh network handles all that seamlessly. The system also checks to see that your WiFi is on the least congested channel every five minutes, swapping as needed. A similar thing happens with switching between 2.4 and 5GHz. All this transitions and switching happens in the background so you will always be getting optimum settings. 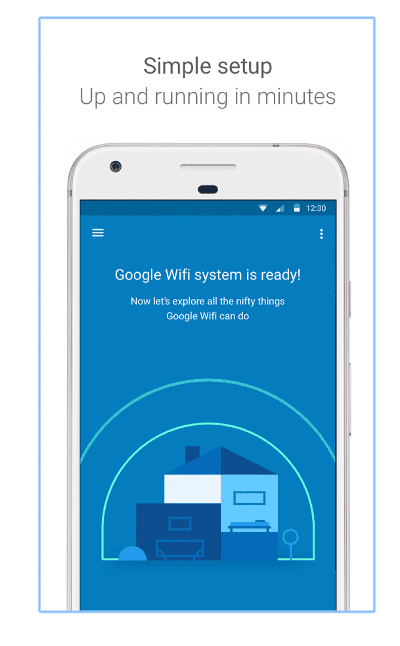 You will be interacting with Google WiFi via an app which you can download in your Smartphone or computer for free. This might however not be ideal for advanced users who wish to gain full control via the control panel. But still, you can get under the hood to access all the advanced manual settings. 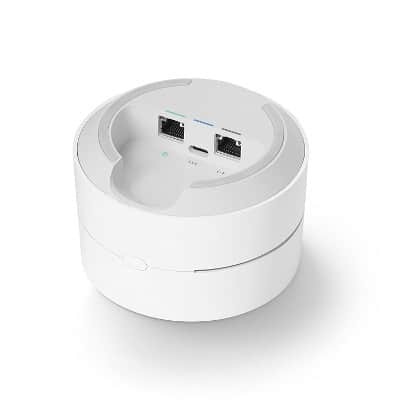 The router has only two Ethernet ports, but this should be more than enough for a network structure that relies primarily on wireless connectivity. The "Network Assist" feature offers a number of practical tools. With the “Priority device” feature, you can tell Google WiFi to prioritize any laptop, phone or smart TV (basically anything on your network). The "Family WiFi" feature helps you to stop or pause internet connection for any device on the network. This basically represents the family control feature on this set. Sharing your password, especially if you have a ridiculously complex one, just got easier. You can copy and paste it directly into practically any messenger in your phone and send it to your friends. But if you don’t want to share your precious password, you still have an option of creating a guest network with a whole new password. This keeps your private personal files and folders away from all other users on the network. The Google WiFi confirms and monitors the speed of the internet coming into your house with two clear numbers for up and down speeds, along with a basic guide on whether that speed is good enough to stream HD or 4K videos. The external design is cylindrical in pleasing white color that sets it aside from all the least attractive black boxes with horny antennas littering the market. This means it will nicely fit into any home décor without sticking out like a sore thumb. Instead of just offering one unit, the Google WiFi system offers up to three routers in one. Each unit is called a WiFi point and can cover about 1,200 square feet, which can adequately cover a small home on its own. A set of three units can easily cover a 4,000 square-feet or even larger home. And you can even connect up to six units if you have an extra large home. All Google WiFi units are identical and one of them acts as the main router when multiple units are connected. The other units extend the Wi-Fi coverage to create a single Wi-Fi mesh network. The Google Wi-Fi app can help you determine the best location to place your units by measuring the connection between units. The app will display your entire home network in an easy to understand layout. You can also use the layout to visualize your entire home network and quickly prioritize the broadband connection to any particular device. Pretty much everything can be done via a few taps on your phone's screen. Google says it will continue to update the WiFi with more features, such as voice control and support for other appliances. 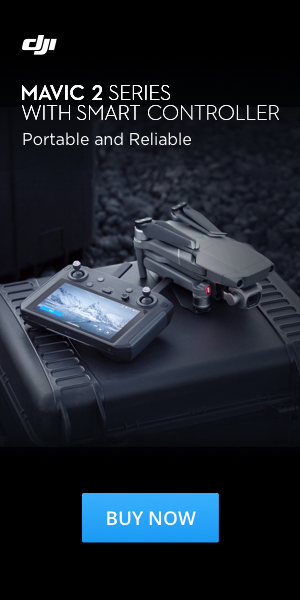 The system delivers both in ease of use and Wi-Fi coverage. You can expect a solid 100Mbps Wi-Fi service from each unit of the set. You will be able to seamlessly stream 4K video through Netflix to your favorite streaming device. You can use the traffic prioritization feature to ensure that your gaming session is getting more of the bandwidth. Additionally, the network can automatically repair itself should one or more of the WiFi Points be accidentally unplugged or otherwise lose power. Google Wifi operates its mesh system over existing Wi-Fi bands (2.4GHz and 5GHz) over the 802.11s mesh protocol. 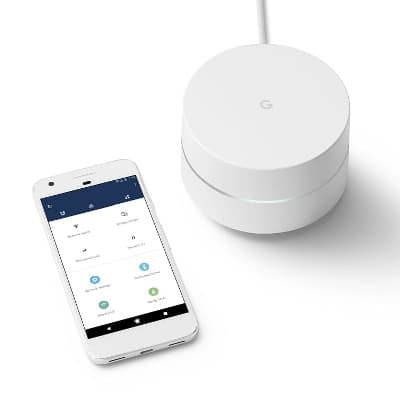 The set offers faster download speeds in MB/s on the 2.4GHz band compared to the likes of ​Netgear Orbi Wifi System The primary advantage of the Google WiFi is wide coverage, but it still performs excellently when it comes to internet speeds. Google WiFi system router is probably the easiest router that you are ever going to use in the near future. For a relatively affordable price, Google offers more units than most competitors and the best setup and management app by far.